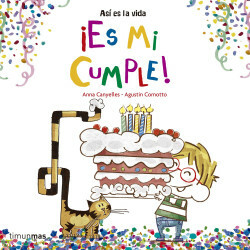 Original title: ¡Es mi cumple! This charming story helps to show us that the important thing in life isn’t the things we have, but being surrounded by the people we love the most. How exciting, today’s my birthday! How can I celebrate it? Maybe I can jump in puddles, or dress up as a monster, or, even better, as a pirate! But what I really want for my birthday is to celebrate it with the people I love!